Messier 38 (M38), also known as the Starfish Cluster, is an open star cluster located in the northern constellation Auriga. The cluster lies at a distance of 4,200 light years from Earth. With an apparent magnitude of 7.4, it is invisible to the naked eye. 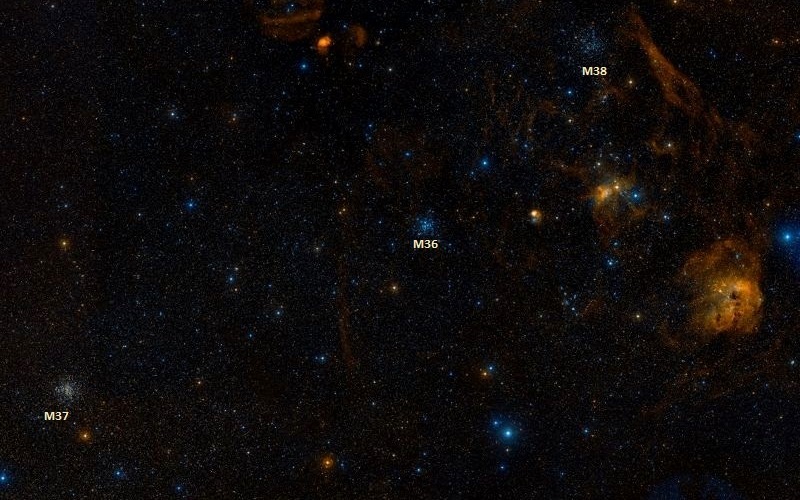 M38 has the designation NGC 1912 in the New General Catalogue. Messier 38 is relatively easy to find because it is located within the polygon formed by the brightest stars of Auriga. The northern point of the polygon is marked by Capella, Alpha Aurigae, the third brightest star in the northern celestial hemisphere. M38 can be found roughly two thirds of the distance from Capella to the bright Alnath (El Nath), the second brightest star in Taurus constellation, which lies to the south of Capella. Messier 38 appears quite large in 10×50 binoculars and binoculars with larger magnification resolve some of the cluster’s stars. 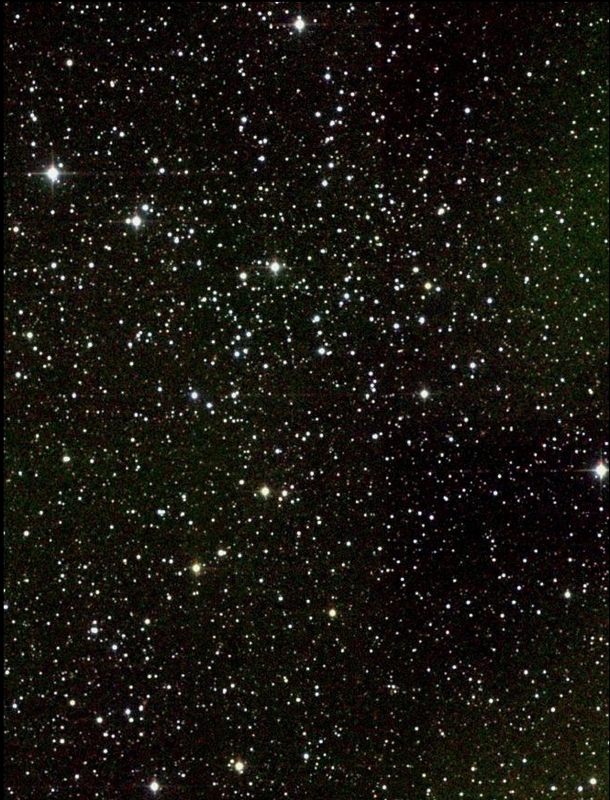 4-inch telescopes show many of the cluster’s stars, mainly concentrated toward the central region and forming an irregular pattern that has been compared to the Greek letter Pi, an irregular arrow and an oblique cross. The cluster’s X shape is even easier to make out in 8-inch telescopes, which reveal stars across the cluster, many of them arranged in pairs. Alternatively, the cluster can be located by first finding Messier 36, which lies just to the west of the midpoint between Mahasim, Theta Aurigae, and Alnath, Beta Tauri. Mahasim is the second star going anti-clockwise from Capella in Auriga‘s polygon. Messier 38 lies 2.3 degrees to the northwest of Messier 36. Messier 37, the third Messier cluster in Auriga, can be found a further 4 degrees to the southeast of Messier 36. Messier 38 is the dimmest of the three open clusters. The best way to observe Messier 38 is in small or medium-sized telescopes at low magnifications and the best time of year to observe the cluster is during the winter months, when Auriga rises high for northern observers. Messier 38 occupies an area of 21 arc minutes in apparent size and has a linear radius of 25 light years. The estimated age of the cluster is 220 million years. The brightest star in M38 is a yellow giant with the stellar classification G0 and a visual magnitude of 7.9. With an absolute magnitude of -1.5, the star is 900 times more luminous than the Sun. Messier 38 is classified as Trumpler type II,2,r, which means that it is a detached cluster with little central concentration (II), that its stars have a moderate range in brightness (2), and that the cluster is richly populated, with more than 100 confirmed members. 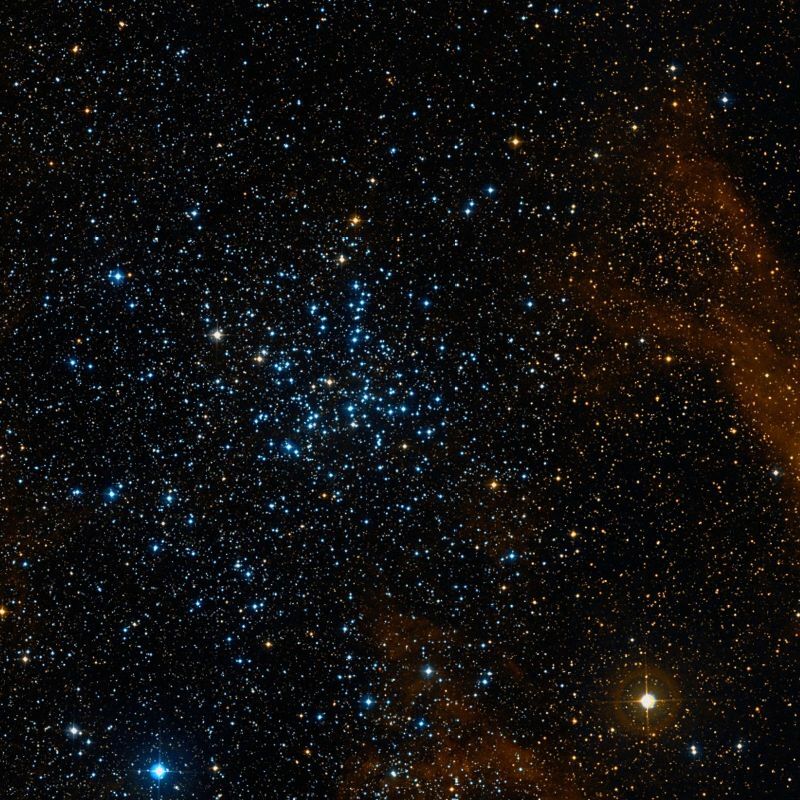 There is another open star cluster, NGC 1907, located in the vicinity of M38. The cluster can be seen roughly 30 arc minutes to the south. It may be undergoing a close encounter with M38. Messier 38 was first discovered by the Italian astronomer Giovanni Battista Hodierna before 1654, at the same time that he discovered the nearby clusters Messier 36 and Messier 37. Guillaume Le Gentil found the clusters M36 and M38 independently in 1749. 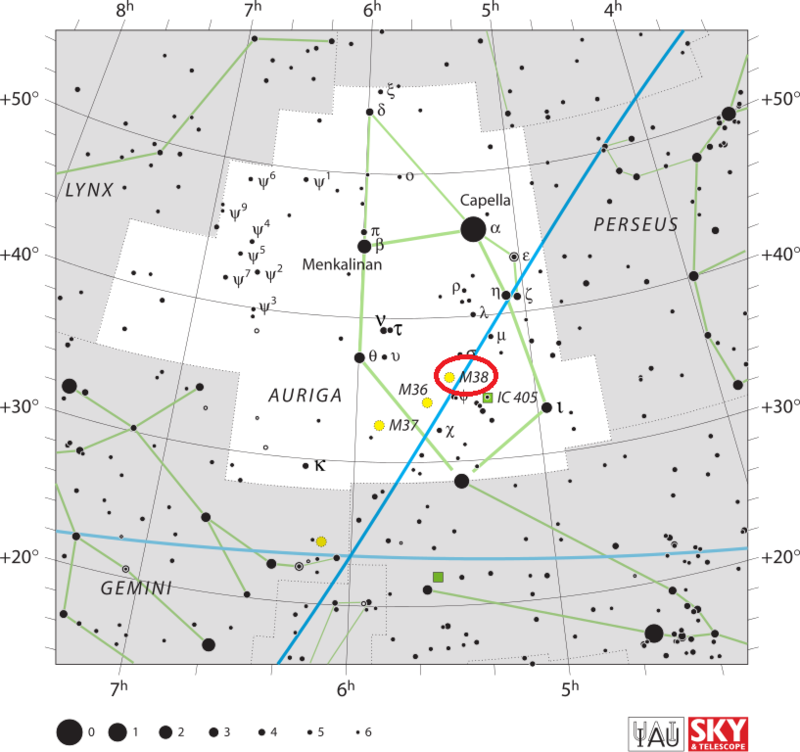 In the night of September 25 to 26, 1764, I have discovered a cluster of small stars in Auriga, near the star Sigma of that constellation, little distant from the two preceding clusters: this one is of square shape, & doesn’t contain any nebulosity, if one examines it with a good instrument: its extension may be 15 minutes of arc. I have determined its position: its right ascension was 78d 10′ 12″, & its declination 36d 11′ 51″ north. Starfish Cluster (Messier 38). Atlas Image mosaic obtained as part of the Two Micron All Sky Survey (2MASS), a joint project of the University of Massachusetts and the Infrared Processing and Analysis Center/California Institute of Technology, funded by the National Aeronautics and Space Administration and the National Science Foundation. A rich cluster of minute stars, on the Waggoner‘s left thigh, of which a remarkable pair in the following are here estimated. A [mag] 7, yellow; and B 9, pale yellow; having a little companion about 25″ off in the sf [south following, SE] quarter. Messier discovered this in 1764, and described it as “a mass of stars of a square form without any nebulosity, extending to about 15’ of a degree;” but it is singular that the palpable cruciform shape of the most clustering part did not attract his notice. It is an oblique cross, with a pair of large [bright] stars in each arm, and a conspicuous single one at the centre; the whole followed by a bright individual of the 7th magnitude. The very unusual shape of this cluster, recalls the sagacity of Sir William Herschel’s speculations upon the subject, and very much favours the idea of an attractive power lodged in the brightest part. For although the form be not globular, it is plainly to be seen that there is a tendency toward sphericity, by the swell of the dimensions as they draw near the most luminous place, denoting, as it were, a stream, or tide, of stars, setting toward the centre. As the stars in the same nebula must be very nearly all at the same relative distance from us, and they appear to be about the same size [brightness], Sir William infers that their real magnitudes must be nearly equal. Granting, therefore, that these nebulae and clusters of stars are formed by their mutual attraction, he concludes that we may judge of their relative age, by the disposition of their component parts, those being the oldest which are the most compressed. To fish up this object, a line from Rigel must be carried northwards through Beta Tauri, on the tip of the Bull‘s left horn, and about 7deg beyond, where it will be intersected by the ray from Capella to Betelgeuze.